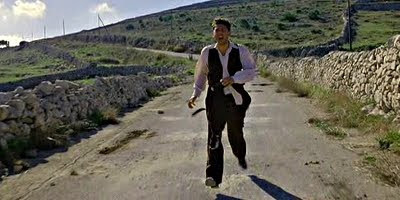 Post World War 2 Sicily is the setting for Giuseppe Tornatore’s deeply cynical portrayal of an amoral con man. Sergio Castellitto plays Joe Morelli, a talent scout charging the desperate for the chance of making a screen test for films that do not exist. There are several amusing vignettes as villagers take part in inept auditions, but the tone soon darkens, as it appears that Morelli is fleecing them. The usual Hollywood-style redemption is not as fully realised as one would expect, and Morelli never becomes a sympathetic character. He sleeps with women in lieu of payment, or allows them to debase themselves for pennies. Morality dictates that Morelli must face the consequences of his actions, but even the unconditional love of a woman he meets does not lead to a Pauline conversion, only a low-key, depressing acceptance. Cinema Paradiso’s Tornatore, the omnipresent Dante Spinotti and the maestro Ennio Morricone all combine to create a truly beautiful film. The ravages of war-torn Sicily contrast with the natural splendour of the countryside, and the soundtrack fits perfectly.